The Northern Village of Buffalo Narrows is located in North-west Saskatchewan at the connection of Peter Pond and the Churchill Lakes. The community lies along highway 155 that extends between La Loche in the north and Beauval in the south. With a population of 1110, Buffalo Narrows is one of the largest communities in north-west Saskatchewan. 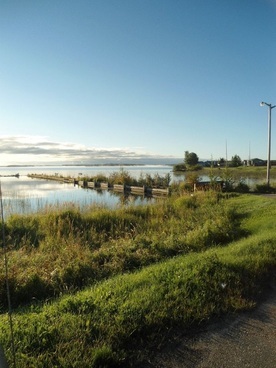 The community has been in existence for centuries due to its prime location at the Narrows between Peter Pond and Churchill Lakes. There was much fur trading through this area due to the transportation route between the Methy Portage up near La Loche, SK and the Île-à-la-Crosse peninsula further south. With the construction of Highway 155, the municipality once again solidified its influence in the area as the connection point at the Narrows. Do you know what an Official Community Plan and Zoning Bylaw are? Do you think zoning bylaws restrict lands sales? Are you unsure about what role government plays in developing an OCP and zoning bylaw? Click here for answers to these questions and more. Draft Official Community Plan (2019): The Official Community Plan (OCP) has received first reading by council. There will be a Public Hearing prior to official adoption. ​ The Exhibits and Future Land Use Maps form part of the OCP. Draft Zoning Bylaw (2019): The Planning for Growth North program has prepared a final Zoning Bylaw to be presented to Council. The Zoning District Maps form part of the Zoning Bylaw. The Use Table shows which Zoning Districts every use is either Permitted or Discretionary in. Basic Planning Statement (2006): The Village of Buffalo Narrows has not completed an Official Community Plan through the Planning for Growth Northern Program, but there is a Basic Planning Statement that was completed back in 2006 by Crosby, Hanna & Associates. This document was approved by the Community Planning Branch and outlines the direction of development within the community. Future Land Use - Map 1A: This map shows an overview of the future land use plans for the municipality of Buffalo Narrows. Future Land Use - Map 1B: This map shows in greater detail where future land use would be most ideal within the central existing community of Buffalo Narrows. Zoning Bylaw (2006): The Village of Buffalo Narrows has not completed an Official Community Plan through the Planning for Growth Northern Program, but when leadership adopted the Basic Planning Statement in 2006, a Zoning Bylaw was also adopted. The Zoning Bylaw outlines the implementation standards within the municipality. Zoning Districts Maps (2006): The Zoning Bylaw is about the implementation of regulations that control building and development within the Northern Village of Buffalo Narrows. By having certain districts agglomerated in certain areas there is less likelihood for opposing land uses and frustration between property users. These maps show the different districts within the municipality. Zoning Districts - Sheet 1: Provides an overview of the entire municipality, where large areas for existing land uses are located, and a location reference to Sheet 2. Zoning Districts - Sheet 2: This map focuses on the Narrows within the municipality and provides reference for future sheets/maps within the municipality. Zoning Districts - Sheet 3: This map shows where the zoning of development would be most ideal in the most northern portion of the Narrows. Zoning Districts - Sheet 4: This map shows where the zoning of development would be most ideal in a north-central portion of the Narrows. Zoning Districts - Sheet 5: This map shows the zoning of development for a west-central portion of the Narrows. Zoning Districts - Sheet 6: This map shows the zoning of development for a east-central portion of the Narrows. Zoning Districts - Sheet 7: This map shows the zoning of development for a south-east portion of the Narrows. Zoning Districts - Sheet 8: This map shows the zoning of development for the southern portion of the Narrows. Current Land Use (2006): In order to understand how development and planning can change in the future, a review of current and existing uses for areas within the municipality is needed. This map shows how the land within Buffalo Narrows is currently being used (i.e., residential areas, commercial areas, etc). Future Growth Study (2006): The expected growth of Buffalo Narrows due to the resource extraction expansion in Northern Saskatchewan prompted the community to develop a plan for future growth. This document goes into detail about projected growth and provides concept plans on how the development could occur. Schematic Truck Routes (2006): As the Northern Village of Buffalo Narrows grows in the future, accommodations will have to be made for increased traffic flow through the community. Due to the municipalities location at the Narrows between Peter Pond and Churchill Lakes all traffic must go through the community. This raises concerns not only for increased traffic, but also the type of traffic that passes through the municipality that may be more dangerous. This map shows where future transportation routes can be diverted to allow for community growth while maintaining safety for local residents. Municipal Constraints (2006): There are certain areas within the municipal boundary of Buffalo Narrows that are unsuitable for future development because of existing infrastructure, areas set aside as buffers between land-uses, flood levels, or natural impediments, such as muskeg or rivers. Flood Hazards - Map 3A: This map shows the northern half of the municipality and the likelihood of flooding to occur in this region. When development occurs, it is important to consider whether that property may be flooded during certain seasons of the year. Flood Hazards - Map 3B: This map shows the southern half of the municipality and its likelihood of flooding. Again, developers much consider the likelihood of flooding within a region prior to construction. Infrastructure Expansion (2006): In anticipation of growth for the Northern Village of Buffalo Narrows, the expansion of existing waterworks infrastructure to provide services to future residents must be considered. This map identifies existing waterworks infrastructure, and then future expansion concepts. Lagoon Expansion Site Plan (2006): As Buffalo Narrows grows, existing infrastructure, such as the sewer lagoon, will need to be replaced with a larger facility to accommodate more residents. This map identifies the most suitable location and size needed for the projected growth. WTP Expansion Site Plan (2006): Similarly, as population and services expand within the municipality, the Water Treatment Plant (WTP) will need to be upgraded and expanded to accommodate this. This map identifies the most suitable location and size needed for the expected growth. Flood Hazard Level (2012): The Saskatchewan Watershed Authority, now referred to as the Water Security Agency, released in 2012 an updated elevation levels for Buffalo Narrows that shows the areas within the municipality that have an increased likelihood of flooding within the municipality. This map is important to understand where municipal constraints exist within the municipality.